God tells us in the Quran that He sent Prophet Muhammad, may the peace and blessings of God be upon him, as a mercy for humankind. "And We have sent you O Muhammad, not but as a mercy for humankind and all that exists." (Quran 21:107) God did not say he was sent to the people of Arabia, or to a specific gender, to the people of the 7th century or even to his own people. In fact Prophet Muhammad was rejected and humiliated by his own people. God also made it clear that Prophet Muhammad, may the peace and blessings of God be upon him, was a prophet like no other. One whose message would spread far and wide and be applicable in all places for all times. He overcame hardship, great sorrow, epic battles and sustained humiliation; however nothing deterred him conveying the message. Prophet Muhammad was the first to convey God’s message in a form suitable for all people, in all places at all times. The main message is simple; to worship God alone, without partners, sons or daughters, and Prophet Muhammad spread it with great forbearance and even greater tolerance. His patience knew no bounds and was never ever goaded into behaving irrationally or angrily. Violence was not part of the message and had no part in its spread. More than one billion Muslims across the globe love Prophet Muhammad, they respect him and follow him. They hold him in such regard that for many it is emotionally painful to see or hear their beloved mentor ridiculed or disrespected. Demonstrations across the globe whenever Prophet Muhammad’s name is disrespected or if his image is produced, hold testament to that. However, violent, irrational behavior is not something learnt from Prophet Muhammad. His face was firmly turned towards God and the Hereafter and his sole mission was to spread the message of the Most Merciful with patience and forbearance. Spreading the word of Islam made Prophet Muhammad poor and a social outcast, after living a life of relative ease. His lifestyle drastically changed for the worst and his life was threatened on more than one occasion. In addition to that his family and his followers were ridiculed, derided and physically beaten. The message however weighed heavily on his shoulders and even at his final sermon he asked the people to testify before God that he had delivered the message. It is important that at this time in world history, when it sometimes seems as if the Muslim population is being herded into a corner or behind a fence, that we remember the patience of Prophet Muhammad and face our problems with the same methods he used in the face of adversity. Prophet Muhammad himself demonstrated enormous restraint and patience when he was insulted, belittled and beaten. As his beloved wife Aisha said, "His character was a reflection of the Quran". At a very difficult time in his life, just after a period known as the Year of Sorrow, Prophet Muhammad went to the city of Taif hoping to find people who would listen and support his message to humanity. Instead of support he found insults and injuries. He was chased out of town. With his sandals filled with blood, from the injuries inflicted upon him by men, women and children throwing rocks, Prophet Muhammad prayed to God for help. In response, the Angel of the Mountains asked for the Prophet’s permission to cause the mountains surrounding Taif to crumble, killing all of the city’s inhabitants. Despite his pain and suffering, something he had every right to be angry about, the Prophet’s reply was, "No, for I hope that God will bring forth from their progeny people who will worship God Alone, and none besides Him." We have all heard the saying patience is a virtue, meaning that being patient is a noble and good trait to acquire.Patience is a quality that we must practice and use in small situations and at times situations that loom large in our lives. Reading even a small slice of Islamic history will show you that Prophet Muhammad was patient.Patience does not mean to do nothing, it implies trying your best to ease the situation.Thus he made efforts to alleviate the situation, such as the two migrations and the buying of slaves primarily to stop their torture and humiliation. After ten years of living in Medina, ten years of teaching the people how to love and obey God, ten years of establishing a fair and equitable Islamic state, Prophet Muhammad and his followers were able to return to Mecca. His patience was at last rewarded yet he still rode in on a donkey with tens of thousands of followers. Prophet Muhammad could have thrown patience to the wind and exact a terrible vengeance. He did not! Mecca lay at his feet, enemies stood with heads bowed in surrender and Prophet Muhammad spokeby the mercy of his Creatorand said, "I speak to you in the same words as (Prophet) Yusuf spoke to his brothers. This day there is no reproof against you; Go your way, for you are free". 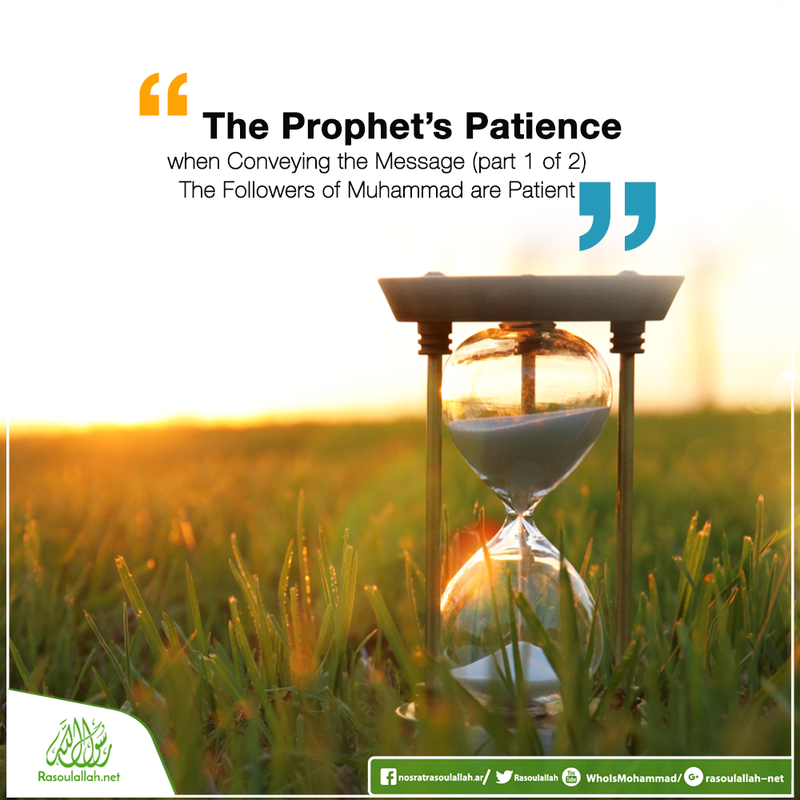 Throughout his life and particularly during his Prophethood, Prophet Muhammad practiced patience and tried to encourage and even demand that his followers learn patience. There are many instances of Prophet Muhammad advising patience. The following story in particular paints a picture of a man who was able to show patience and forbearance above what is usual, but it also shows the lengths Prophet Muhammad would go to in order to teach his followers why they should always behave patiently and in the most correct way. This is the story of the Jewish Rabbi, Zaid ibn Sanah. Rabbi Zaid had loaned something to Prophet Muhammad. He himself describes the scene and dialogue as follows. "…Prophet Muhammad was attending the funeral of a man from the Ansar. Abu Bakr and Umar, Uthman and some other Companions were with him. After the funeral prayer he sat down close to a wall, and I came towards him, grabbed him by the edges of his cloak, looked at him in a harsh way, and said, ‘O Muhammad! Will you not pay me back my loan? I have not known the family of Abdul-Mutalib to delay in repaying debts!’ I looked at Umar whose eyes were swollen with anger! He looked at me and said: ‘O enemy of God, do you talk to the Messenger of God and behave towards him in this manner?! By the One who sent him with the truth, had it not been for the fear of not entering the Heavenly Gardens, I would have beheaded you with my sword!’"
Prophet Muhammad was not late in repaying the debt, the Rabbi had accosted him and spoken badly. How would we react? In this year 2015 how would the majority of people react? If you know those who would react calmly and accept harsh treatment with patience then you will be glad to know they are following the teachings of Prophet Muhammad. In the next part we will discover just how this incident concluded and it just may surprise you. Why Muhammad Didn't Die for Muslims' Sins?